Free Shipping Included! 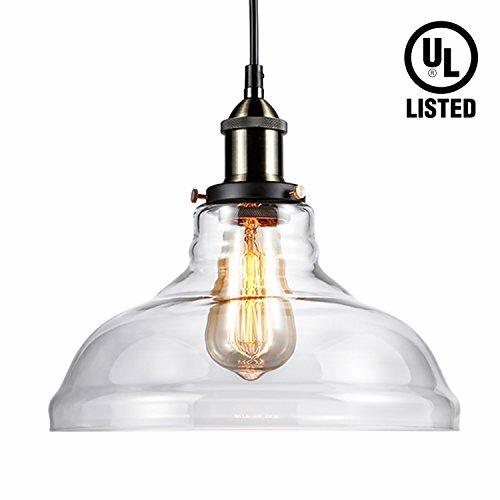 LEONLITE 1-Light Industrial Clear Glass Pendant Light Fixture, UL Listed, E26 Base, Edison Vintage Style Lampshade, Adjustable Height, for Kitchen, Dining Room, Restaurant, Cafe by LEONLITE at My Athenas. MPN: DHPLF-G. Hurry! Limited time offer. Offer valid only while supplies last. Simple and Elegant Design Having the perfect pendant light that goes with your decoration style can greatly improve the overall look of your house. crystal-clear transparent glass, it will add a perfect touch to your furnishing and balance the elements around it. any interior spaces that you want to add a touch of uniqueness without looking overwhelming or trying-hard. won't turn yellow and brittle even with years of constant operation, same good-look that won't fade through time.